KEN Holmqvist may have seen little action in the recent UAAP Season 78 and few fans know him, but Far Eastern University coach Nash Racela feels the Tamaraws' Fil-Norwegian big man has what it takes to be a member of the Gilas Pilipinas squad someday. The 6-8 Holmqvist is a big guy who can shoot - exactly what Gilas needs in the future, said Racela. 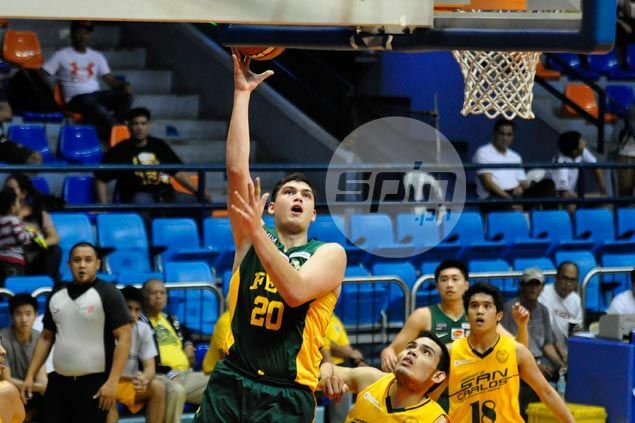 The 21-year-old Holmqvist was a revelation on Thursday during the Tamaraws’ match against the University of San Carlos Warriors in one of two 'championship games' of the 2015 National Collegiate Championship, finishing with 17 points and 11 rebounds. He was even perfect from the field in the first half when he connected on eight shots including a buzzer-beater at halftime, en route to winning MVP of the Tournament honors while leading the Tamaraws to the co-championship with San Beda. That's not bad for a guy who only played a grand total of 28 minutes in seven games with FEU in the elimination round of UAAP Season 78 as a rookie. While he appreciated Racela's comments, Holmqvist said he still has a long way to go to be able to reach Gilas level. Nevertheless, he said Racela's words will make him work even harder this offseason. “I don’t know. I like his (Racela) confidence in me. Just have to keep on working hard. He is a great coach,” said Holmqvist. Racela said Holmqvist only needs more games to develop and fulfill his potential. “He lacks the experience. He needs more games so he’ll be tougher. But we are happy with the way he has been developing,” said Racela. Holmqvist said he is determined to make the big leap for the Tamaraws next season since six veterans will no longer be with the team, among them Mac Belo, Mike Tolomia, Roger Pogoy, and Russell Escoto. “I hope so (contribute next year). I’ll continue to work on it (outside shots). We got a lot of veterans going out like Russell. He is playing the four. Hopefully, I can fill that spot and work on my midrange,” said Holmqvist.